We have been serving this recipe at Woodhavensince November of 1993 when I found it in my "Bon Appetite" magazine. It was a recipe from a restaurant in California. We started using french bread but switched to the Great Harvest farmhouse white when we ran out of the french bread one morning ....and the guests liked it better! It is not overly sweet but truly decadent. Also we have increased the caramel over the years and even serve a drizzle more over each piece. We all agree that one can not have enough caramel! So many guests ask for the recipe that we have it printed on a special card that they can take with them. And most guests mention it in their posting in the guest comment books in each room. This is especially good when you are having family or friends for a brunch because the preparation is all done the night before and then all you have to do is pop it in the oven to cook. Melt butter, brown sugar and Karo syrup in saucepan over medium heat. Stir often and bring to boil, then pour into a 9x11 inch casserole. Layer slices of bread over the caramel mixture, using three slices together to make a one inch depth. Mix eggs, and milk and vanilla well and pour over the bread. Gently lift each slice of bread to make sure that the milk mixture has coated all the bread. The sprinkle cinnamon over the top and cover with plastic wrap. Refrigerate overnight. Uncover and bake at 350 degree oven for about 45 minutes, or until slightly puffy and set. 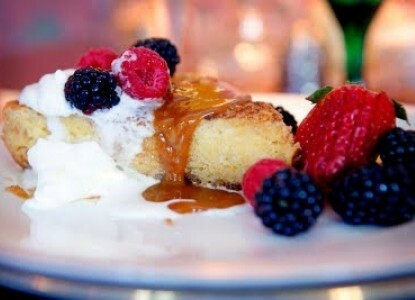 Serve with a garnish of berries and whipped cream.